I'd like to propose a new series "Why It Works." We'll break down some rooms and talk about all the things that make it fabulous. My girl Jamie has done this in the past, and I always love them, so let's take some inspiration from her brilliance. Sound good? First up, this kitchen by T. Keller Donovan. Gorgeous right? Right. But a closer look reveals that it probably had humble roots (check out that stove!). Let's embrace that and figure out how you too can spice up a small kitchen…on a budget. 1. Light it up. Even the most basic pendant lamps can spice up a regular old rental. 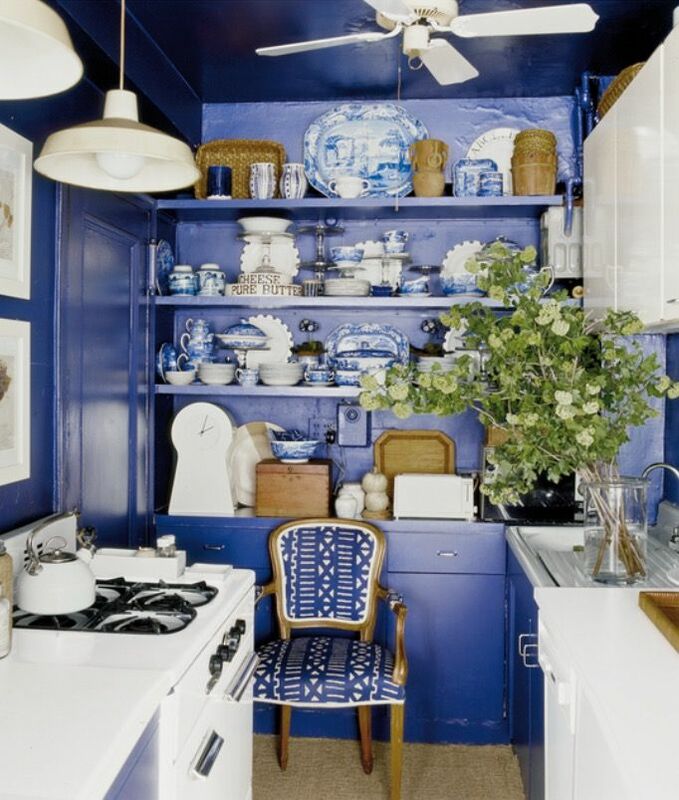 These white lights pop against the blue paint of the kitchen and bring light to the upper part of the room. Never underestimate the power of overhead lighting. Even if rental restraints mean you have to string a light on a cord, it's worth the extra effort. Here's a similar style from Ikea. 2. Dark blue walls receded into the background, making the room appear bigger than it actually is. Dark paint is a bold (and sometimes scary choice) but it pays off here. By painting only the back wall and the bottom cabinets, the room still feels open. If you have a room that's a U-shape, take advantage of the natural depth and paint the back wall a dark color. Unlike most dark paint jobs, which make rooms feel smaller, painting only the back wall can actually make the room feel larger. 3. Without any curtains, this room could be a sad, textile-free zone. However, this side chair has come to the rescue. It packs a punch with a bold, modern print that keeps the room from becoming to granny chic. Best of all, it can be pulled out into the living room (or dining room) when the party expands. What some more side chair ideas? Check out some of my favorites here. 4. Open shelving is like a magical rotating art exhibit. Of course, it's a challenge to keep things looking clean, but this room has it down. The porcelain and wood really pop against the dark walls. 5. Every room needs a real plant. Every. Single. Room. But don't fret, it doesn't have to be anything crazy. Here some simple flowers are thrown in a glass vase. Nothing particularly special about the whole situation right? Oh wait. The size. The giant arrangement in such a small kitchen really makes a statement. *If you're looking for a good plant resource in NYC, check out The Sill. They deliver plants to your doorstep and have great instructions on how to care for them. I'm currently attempting to keep my fiddle fig alive and their directions have been helpful. 6. Not your landlords carpet. Something tells me this place didn't come with the sisal. You might not think to put carpet in the kitchen (hello spills) but hey, why not? Sisal isn't particularly expensive and it's easy to clean. It's a great choice for rental apartments where you want to bring in some texture without spending a lot. If you're feeling really handy (and you have a small space) you could just buy an inexpensive rug from Ikea and cut it to match your space. I won't tell anyone it wasn't custom. Promise. So, what do you think about this series? Are we into it? Do you have a room you want me to break down? Let me know!